Though the mention of the Commissioners seems to suggest that the decision to build the road originated in the districts of Moyamensing and Southwark, Scharff and Wescott’s ponderous History of Philadelphia‘s account of the road’s construction complicates this interpretation. It states that in 1794 the state legislature ordered the opening of the “Federal Street” which was “surveyed under the act of 1787.” What was this act of 1787? It is unlikely that Scharff and Wescott are referring to the Federal Ordinance of 1787 which organized settlement in the Northwest Territory. Although it’s more likely that the “act of 1787” refers to a state act, other accounts insinuate that the Federal government did have a hand in the building of Federal St.
Robert Alotta’s Street Names of Philadelphia states that the street was deemed “Federal” “because it led from the early navy yard to the federal arsenal near Gray’s Ferry.” True, some structures at the Schuylkill Arsenal at 2620 Gray’s Ferry Road had existed since 1799 and Brandt and Gummere’s Byways and Boulevards in and about Historic Philadelphia reports that “records at the Arsenal begin with 1781 and include numerous transactions prior to 1800.” It is clear that the arsenal became a Federal facility—the third in the nation—around 1799. Similarly, Joshua Humphreys shipyard, located just south of Gloria Dei was federalized in 1801 becoming the first Philadelphia Navy Yard. Just as these two facilities were coming on line, Pennsylvania ordered Federal St. open. It is understandable that the federal government would want a link between its chief weapons plant and its chief shipyard in the early national period. 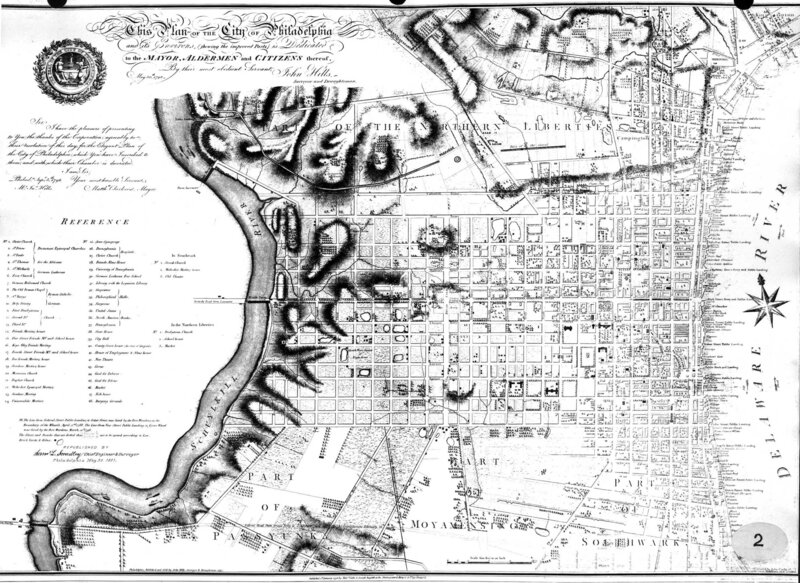 The Federal government could have easily impressed its will upon the physical structure of the city since during the entire period (1790-1800) Philadelphia served as the nation’s capital. Recall, too, that America—and Philadelphia—were animated by a strong fear of French maritime aggression and a series of sea spats between our former ally had engendered our first flirtation with Francophobia. This affair has subsequently become known as the Quasi-War. This period of French Revolutionary piracy precipitated the passage of the Naval Act of 1794 which sought to ramp up American ship production. Joshua Humphreys’ shipyard was abuzz with activity and traffic along the Federal St. from the Arsenal to the shipyard probably intensified. The Arsenal surely provided the stores, small arms, and uniforms worn by the sailors and marines aboard America’s new fleet. The records of the Arsenal also show that Lewis and Clark’s 1803 expedition was outfitted by the Arsenal. Also, documents testify that “’gifts’ or annuities sent to the Barbary ‘pirates’” hailed from Philadelphia, PA: all of which probably traveled the Federal Road. Below are pictures of a trip along the old Federal Road from the Schuylkill Arsenal to roughly the area of the original Navy Yard. Wow, our founding fathers wouldn’t recognize the place. It’s a slum. Looks like a Third World city in Africa or Latin America. A city in decline. How sad for the nation’s former capital.